In What’s Up with the Series A, Nikhil Basu Trivedi documents the bifurcation in the Series A market. While there are a handful of startups that raise blockbuster Series As of greater than $10M, the average Series A investment size remains relatively constant over the past 6 years just around $5.3M for US technology companies according to Crunchbase data. After reading his post, I wondered if a big seed round is a leading indicator of a big series A. In other words, would larger seed rounds provide enough negotiating leverage in fundraising conversations to bolster average check sizes and increase pre-money valuations? Let’s go to the data. Below is a chart of 726 startups who raised a seed and a follow-on Series A anytime from 2005-2013. The x-axis is the size of the seed round in $k and the y-axis is the size of the Series A in $M. Each dot represents one startup. There isn’t a clear pattern within the data but we can make three important observations. First, Series As rarely exceed $10M for companies with seed stage financing and the distribution of these financings tends to be relatively independent of seed investment size. Second, in the top right, we see a cluster of large-seed and large Series A companies, but the sample size is quite small, only 4. Third, the correlation between the size of the seed round and the size of the Series A is tenuous at about 0.25 R^2. 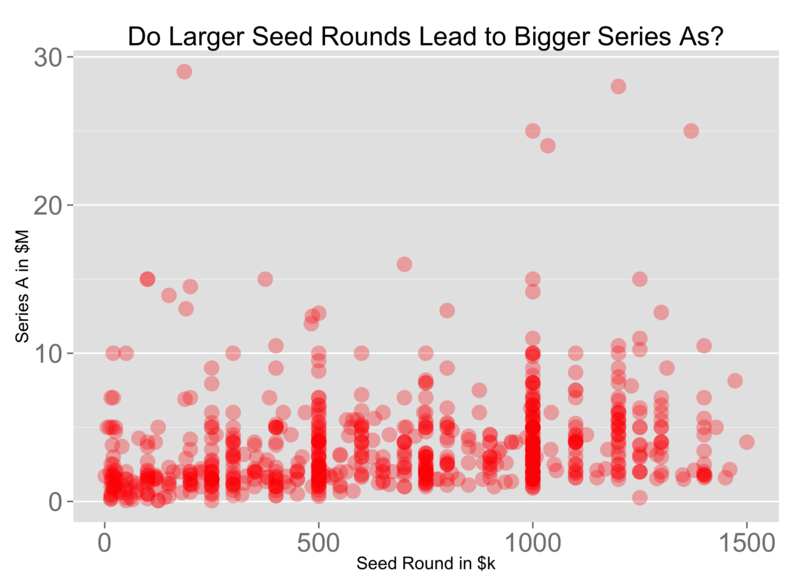 I can’t argue larger seed rounds precede larger As. But, there is a nugget of useful insight in the data. Below I’ve charted the distribution of seed investments by size on the left, and the distribution of Series A investmens by size on the right. They are quite different. Seed investments are uniformly distributed, but Series A investments follow a power-law distribution. Fundraising is never simple or easy, but there is a marked difference in the difficulty of raising a large seed compared to large A. Roughly 18% of startups in this data set raised a $1.5M+ series seed, but fewer than 8.5% of these startups raised a Series A of greater than $10M. Said another way, there is 3x more capital available for sub-$10M Series As than for greater than $10M As. In contrast, the amount of capital invested in seeds greater than $1M is about twice as big compared to small seeds, which is quite likely an artifact of the rise of the dedicated seed fund and traditional VCs’ entry into the seed market. 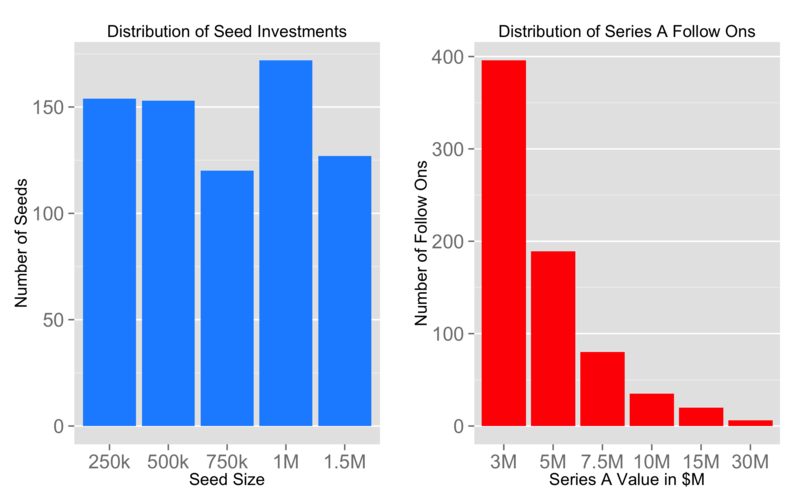 All in all, larger seeds may not have a strong effect on the size of the Series A a startup can raise. But, at least at this point in the market, it’s becoming easier for founders to raise substantial seed rounds. The numbers I’m using here differ from Nikhil’s because in addition to geography, I filtered the industry to tech companies, which seem to garner larger investments than the average Series A.